So which do you see? 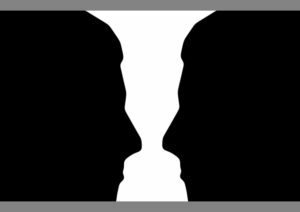 Two faces or a vase? If you said, “I see a candlestick holder”, okay, you still get a point. However, the truth is that it doesn’t make a difference: Others’ perception IS a leader’s reality. Period. Unless the leader deals exclusively with the quantitative, which can be reliably measured and verified by disparate people, how people perceive you is your reality. Who is to say that I’m not friendly? That I’m not hard-working? That I’m not rude? That I’m not a micro-manager? Is there really an objective, independent measure for each of these? And truly what I think is not as important as what others believe. If they believe I’m kind, then I’m kind. If they believe I’m a jerk, then I’m a jerk. And anyway, it’s a Pyrrhic victory asserting or trying to prove I’m not a [insert cringe-worthy noun here]. And do I truly want to fight that fight? So, I see a hard-working, motivated leader, and they see a steamroller. But what I think, will do little to change what they think. Their perception is your reality. It needs accepting. Lead such that your behaviors and actions are unequivocal, living contradictions to their perception. It will take consistency (over months, not days) and commitment. You may not win over all of them. But you will likely convert some of them. And in truth, what other option do you have?